Whew its been a while. I've been through hell lately. Anyways this here is my latest wallpaper that I finished just a while ago. Worked on it for around 4-5 hours, trying to tweak it here and there. It's Enmai Ai from Jigoku Shoujo, I'm sure a lot of fans would know. There are about 13-15 layers in there, I'm not quite sure, I kinda forgot. I was actually making a background for Athrun Zala but I think it became too grungy and I browsed through my scans to see what I can make from this. And voila, I found her. Mhm, well, I altered the colour of her kimono/yukata or whatever-you-call-it from green+multicoloured patterns into black+pink/purple patterns. I don't know why, but I prefer it that way and it looks better with the background. 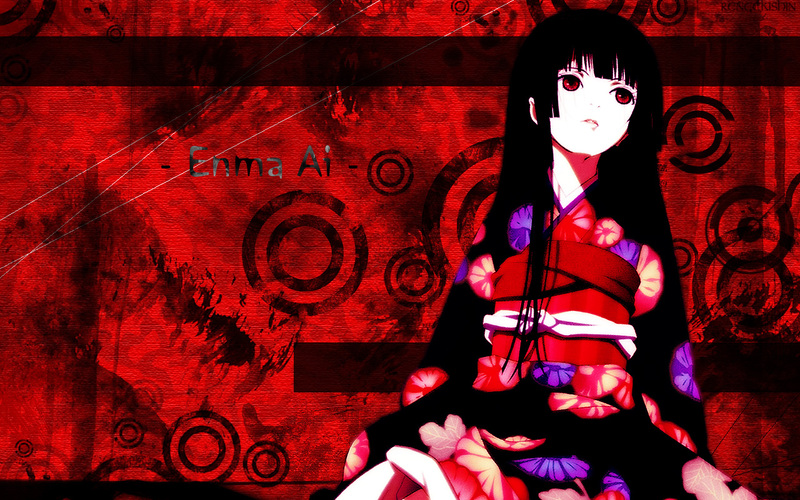 Pardon me if this does not please Jigoku Shoujo fans but I did whatever I could, for now. I will appreciate any constructive comments, if possible, for me to improve. On a side note, I was eating Strawberry Tarts while making this and I was listening to Linkin Park's latest album, Minutes to Midnight. Oh and its resolution is 1280x800. Please fullview before leaving comments. Enjoy, ciao. it's great ! the effect too ! thanks for the wall ! Remarkably, it is a done!